On Friday, the Singapore Makers Association hosted a symposium for educators. The panel discussion to start the day was a good opportunity to learn more about the state of maker education around Singapore. It was interesting to note the differing perspectives on the subject. In particular, I was struck by how many of the attendees from international schools see the so-called "Maker Movement" as an empty, meaningless term asking, "What's so new about making things? and ,"Did people ever stop making things?" On the flipside, a number of of people from Singapore and SE Asia insisted that, at least for them, this is indeed new. Many people here will go their entire lives without getting anywhere near a tool and the idea of fixing something or making something yourself is entirely foreign. For Singapore especially, there is a real stigma against working with your hands--that it's seen as low-brow, blue collar etc... For a woman to take an interest is even more unusual and culturally discouraged. So it was exciting to see such a great turnout of people genuinely interested in helping usher in a new era for maker culture. The afternoon was filled with workshops on a whole range of topics. 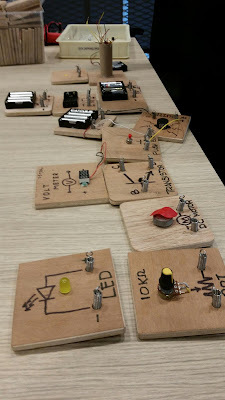 The first one that I did was about how to make circuit tiles as a way of introducing kids to electronics. They are easy to make and I think, in many ways, a better teaching tool than more ready-made equipment. Although I'm a big fan of Snap Circuits and Littlebits, and for sure, those tools offer a lot more options, these tiles are very straightforward and it's really easy for kids to get their heads around the flow of electricity and how each component works. And they are cheap enough to make that you can afford to let kids really mess around with them. It's no big deal to replace components if something burns out, unlike some more expensive products. 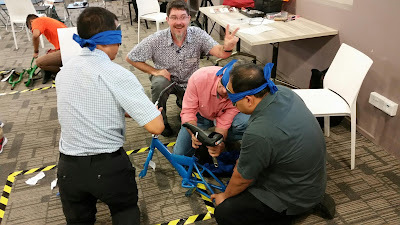 The next workshop was a fun one that was meant as a team-building activity that would also introduce participants to the parts of a bicycle and how they work. We were put in groups of five. Three people were 'mechanics' an two were 'engineers'. On the floor was a range of bike parts and tools. The mechanics were blindfolded and had to follow the instructions provided by the engineers to put the bikes back together. I don't know how many of my students could do this without the blindfolds, but I have a few old bikes that I pulled out of the trash so one of these days I will give it a shot and post back with how it went. This was a great event and I'm pleased to see these guys taking a leadership role in promoting Maker Education in Singapore. This year, we have been running monthly meetups for maker-educators that includes a lot of the same people. So if you were unable to make it but want to tap into this growing community, drop me a line, or check on the SingaporeMakers website to add your name to the mailing list so you can keep up with those meetings. We try to visit a different school each month.